As the story goes, Alfred Heineken had an epiphany while on a world tour of Heineken factories. When Heineken was on the Caribbean island of Curacao in 1960 he saw many bottles littering the beach due to the fact that the island had no economic means of returning the bottles to the bottling plants from which they had come. He was also concerned with the lack of affordable building materials and the inadequate living conditions plaguing Curacao's lower-class. Envisioning a solution for these problems, he found a dutch architect John Habraken to design what he called "a brick that holds beer." Over the next three years, the Heineken WOBO went through a design process. Some of the early designs were of interlocking and self-aligning bottles. The idea sprung from the belief that the need for mortar would add complexity and expense to the bottle wall's simplicity and affordability. Some designs proved to be effective building materials but too heavy and slow-forming to be economically produced. 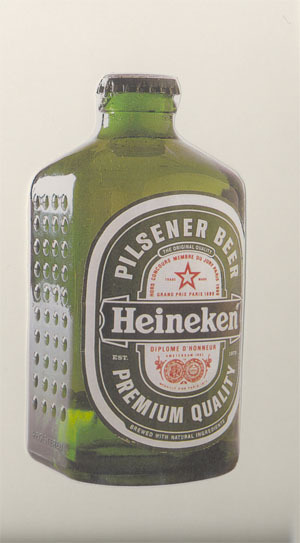 Other designs were rejected by Heineken based on aesthetic preferences. In the end, the bottle that was selected was a compromise between the previous designs. The bottle was designed to be interlocking, laid horizontally and bonded with cement mortar with a silicon additive. A 10 ft x 10 ft shack would take approximately 1,000 bottles to build. In 1963, 100,000 WOBO's were produced in two sizes, 350 and 500 mm. This size difference was necessary in order to bond the bottles when building a wall, in the same way as a half brick is necessary when building with bricks.Unfortunately most of them are destroyed and no bottles are left. They are very rare and become a collectors item. Only two WOBO structures exist and they are both on the Heineken estate in Noordwijk, near Amsterdam. The first was a small shed which had a corrugated iron roof and timber supports where the builder could not work out how to resolve the junction between necks and bases running in the same direction. Later, a timber double garage was renovated with WOBO siding. Alfred Heineken did not develop the WOBO concept further and the idea never got a chance to materialize. Rinus van den Berg, a dutch industrial & architectural designer designed several buildings while working with John Habraken in the 1970's. One design was published in Domus 1976.
i bet those things are/were beautiful. hm. how do i convince my wife that i need to build a shed out of beer bottles? and that i have to empty them? and, actually, you're right, paul. this might be part of an interesting solution that could work now in some far-flung places. 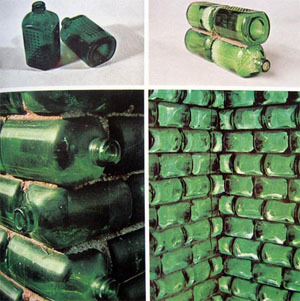 maybe using the ubiquitous plastic water bottle as a building material instead of a beer bottle?